The price per trade is $425. As a returning student please contact the office directly for the returning student price. 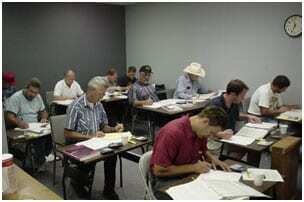 The contractor exam preparation is available at our office in Baton Rouge. The self-paced study programs are available 6 days a week and are open for students to come and go at any time during office hours. Students can attend as many times within one year from the date of registration as needed until they feel prepared for the exam. During classroom study, students are given materials and practice tests. After taking the practice test, the students review and clarify any questions they may have with the instructor. Other services offered in addition to the classroom instruction include one-on-one question and answer sessions with the instructor and live plumbing seminars. Study in our office and get personalized help preparing for your contractors exam. The Louisiana plumbing state licensing exam is closed book, four hours, and has 80 multiple choice questions. The plumbing license exam covers the following topics: potable and nonpotable water systems; construction, removal, repair, and maintenance for buildings and premises; sanitary and non-sanitary waste and sewerage construction; removal, repair, and maintenance for buildings and premises. In Louisiana you must also take a business and law exam, which is closed book and three hours. This exam covers the following topics: license law, federal and state tax laws, labor laws, estimating and bidding, contracts, project management, risk management, accounting, business organizations, Louisiana lien laws and contractor safety practices. Now offering private 1 on 1 phone assistance for students! Students that have purchased the at home study software and are unable to come to our in-class can now receive help with math questions from the instructor over the phone. The price is $35 for 30 minutes or $60 per hour, with a minimum of 30 minutes. Call for scheduling with our instructor. PLEASE NOTE that you must have purchased the study software or in-class before you may use this service, also that you must schedule with the instructor prior to the phone session. To schedule a personal online help session please call: 1-800-432-9930 or 225-293-8107.